Sports wrap styling provides superior peripheral protection from light, wind and debris. ideal for a variety of sports activities. Unisex sport frame, fits most regular sized adults. Features 8-base wrap styling with 6-base optics to easily suit a wide range of prescriptions. 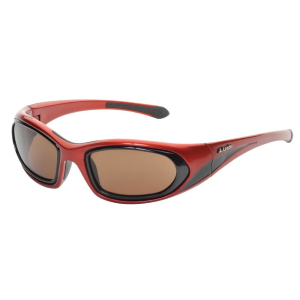 All styles include: 6-Base adaptor with Plano impact resistant polycarbonate sun lenses. Over moulded temples for added comfort. Deluxe zipper carrying case, microfibre cleaning cloth and sports strap. Offers multiple wearing options with multiple lens options. You can even remove the prescription adaptor and wear 'as is' with pre-edged 8-base polarised lenses (available separately) if you wear contact lenses for example. Rx RANGE: +3.00 to -6.00 with opposite cyls to 2.00. If you require the frame only simply add to cart and checkout. If you require this frame glazing you have two options. If all you require is stock hardcoated CR39 lenses, you can enter the lens power you require in the text box. This will appear in the checkout once you have added the item to your cart. The lenses will include tint colour/depth & UV400 to match. Be sure to define Right (R) and Left (L) lenses, your P.D measurement, your age and prescription date. No powers beyond stock! No prisms! If you require lens coatings or thinner lenses for example, please complete and return the spectacle order form and submit an off-line order. These files are also available in Downloadable forms at the bottom of the page.